Every business today is looking to lower costs. Many struggles with managing and finding internal IT experts who are both affordable and efficient. Continuous IT budget cuts result in downtime, software issues, and security breaches. Research has shown that a growing number of organizations are turning to third-party hosting providers and managed services providers (MSPs) to help manage their business systems. New research from Market to Market shows that the managed services market is estimated to grow from $145.33 Billion in 2016 to $242.45 Billion by 2021, at a Compound Annual Growth Rate (CAGR) of 10.8% during the forecast period. The major forces that are driving the managed services market include flexibility to match custom requirements, a continuous upsurge in dependency over heterogeneous networks, and persistent rise in the complexity of technological solutions. While some organizations are looking for large scale hosting providers and MSPs such as Amazon Web Services (AWS) or Microsoft Azure, others are looking for a smaller provider specialized in specific technologies such as SAP. Either way, SAP hosting providers and MSPs are finding they need to provide phenomenal services to compete in today’s marketplace. SAP is the heart of businesses, facilitating the flow of information and metrics to all levels and units within the organization. An SAP outage of only a few minutes can cost an organization hundreds of thousands of dollars if not more. Both large scale and smaller SAP hosting providers and MSPs understand this and know they need to provide a level of support and availability above and beyond standard, non-SAP, hosting and consulting practices. Watch Xandria for MSPs demo NOW! With the recent surge of companies migrating to HANA, many do not want to take on the cost of an in-house HANA appliance and are turning to third-party hosting providers specializing in SAP. As they weed through the various SAP hosting providers they are not only demanding near zero downtime, they are also looking for the providers to offer instant information and complete real-time visibility, allow for change tracking for security and audit purposes while keeping a close track of SLA levels and open issues. Transparency is key. Organizations don’t want to wait for quarterly, monthly, weekly or even daily SAP system health reports. The demand for instant information is there, and providers that can’t meet it are being left in the dust. Many SAP hosting providers are moving to a portal based model. The portal offers the customer direct access to the monitoring tools that the support teams are utilizing. This gives the customer up to the minute visibility into the health statistics of their business critical systems. Trends and failures of CPU, memory or disk utilization are expected to be recognized in real-time. 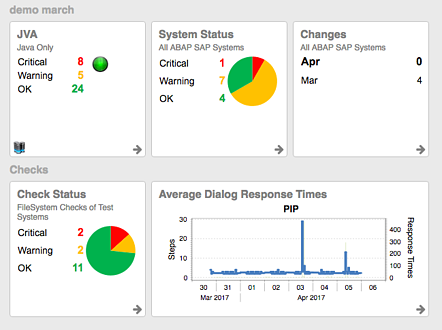 Customers are now expecting greater visibility into errors, warnings and overall health of their SAP environment. ABAP short dumps, aborted jobs, performance data, cross-system connections (the list could go on) are all components of information that need to be delivered in real-time. Having to wait days or even hours for third party support teams to provide this information is now considered unacceptable. Online portals, giving customers live data at their fingertips combined with reports which are automatically generated and sent to their inbox is becoming industry standard. Another very important measurement organizations are grading hosting providers on, is their ability to identify and remedy any intrusion into their systems. Any good SAP hosting provider has robust network threat detection already in place, but not all can monitor the security of the SAP system itself. Hackers are sneaky these days and have found many ways to get into the network of an organization. That’s where SAP system hardening comes into play. Organizations are now looking to their SAP hosting providers and MSPs to ensure their systems are securely locked down and immediately identify and notify if any SAP system security settings are changed. This is not only important from a preventative measure, but also from a yearly audit perspective. Most companies are now frequently audited and need to provide proof that their system change control process was followed. Ensuring that SAP admin and database users are secure is a tedious process that is now falling on the shoulders of the hosting providers and MSPs as well. And yet again, organizations do not want to wait for days or even hours for this information. They need their SAP support teams to provide this information immediately with no delay. Many organizations are now also keen on what constitutes true SLAs within SAP. A non-SAP hosting provider may track system availability via the up/down of the SAP services itself. The problem is that while SAP may be up, there are a handful of reasons why SAP may not be available for use. SAP management at many organizations have gotten wise to this and have started asking for SLAs based on additional metrics such as end user’s ability to logon. This has stumped many hosting providers who struggle to provide this information when asked. Lastly, this all comes together with incident management systems. While organizations are looking to their SAP hosting providers and MSPs to provide further granularity into their SAP landscapes, they also want everything tracked via ticket or incident. Some companies are fine having this information in the hosting provider’s incident management system while others would like all issues tracked in their own ticketing systems. SAP hosting providers are finding themselves needing to be nimble enough to accommodate the customer’s request. Issue tracking is extremely important and not being able to provide this information, without manual interaction, is a deal breaker for most. Providing very deep, technical information comes at a cost to the SAP hosting providers and MSPs. Setting up and configuring multiple tools that can accommodate all of these requirements takes a significant amount of time and effort of their support teams and complicate on-going operation and reporting. One tool that answers all these needs is Xandria. Many SAP hosting providers and MSPs globally are turning to the product the leads this market. The time to implement Xandria’s toolset is almost zero as it can auto-detect all the systems it is connecting to and automatically implements checks and thresholds based on the type of system, saving the provider’s valuable resources, time and costs. Xandria gives SAP hosting providers and MSPs full control of customer access permissions to allow the right people the information they need and even utilize all the tool’s functionality. By letting the customer run reports, view system health dashboards, review system security changes for audit, receive notifications and run predictive charts to help them in their budgeting for the following year Xandria helps MSPs building trust and a strengthen their relationship. MSPs can’t stay behind their competitors, being able to provide full transparency, granular real-time reports 24/7/365, tracking of committed SLA and full track of changes, tickets and audit readiness become a competitive option allowing them to offer new solutions with increased revenues. Watch Xandria for MSPs and hosting providers demo NOW!